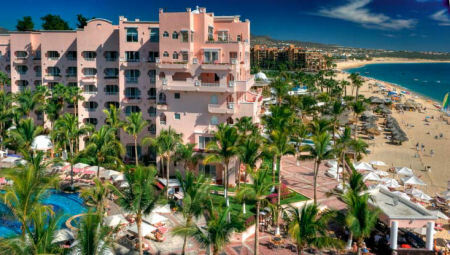 Enjoy 7 Nights at Pueblo Bonito Rose Resort & Spa in Cabo San Lucas Mexico! The Pueblo Bonito Rosé Resort & Spa offers exclusive access to El Medano Beach. A few steps from its large free form pool, are miles of beach that stretch as far as the eye can see. The main beach in Cabo San Lucas is El Medano Beach and is safe for swimming. 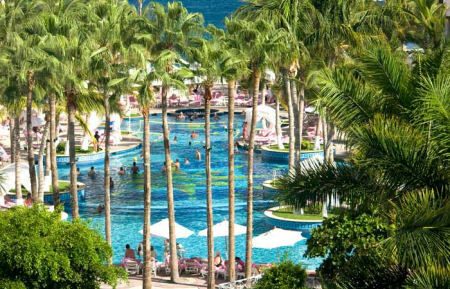 Pueblo Bonito Rosé Resort & Spa offers guests an accessible location right in the heart of Cabo San Lucas. The Cabo San Lucas downtown area is within walking distance of the resort. Golf clubs and other attractions in Los Cabos are located nearby. The Arch, a prominent place known as "The End of the World", can be seen from the resort and can be accessed by water taxi from El Medano Beach or from the marina. Junior Suites. Our Junior Suites feature over 575 square feet of living space, including two double or king bed, an open living area. Junior Suites accommodate up to four people. The following lifestyle amenities are standard features in every suite accommodation at Pueblo Bonito Rosé Resort & Spa. Resort activities fee is $17 US dollar for Spa and Gym. Fee is per person per day. Fee is only charged for the days you use the Spa or Gym. For your convenience, we have started a new no-cash-needed program. We strive to create an easy, simple, carefree vacation atmosphere at our resorts. With this new program, you can simply relax. You as a guest can make all your charges to your room and then during the checkout, you can pay the itemized bill however you wish.